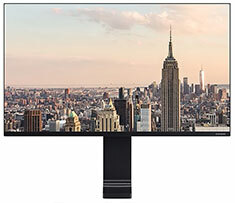 The Samsung R750 32in UHD VA monitor features a 31.5in screen size, UHD 3,840 x 2,160 resolution, 4ms GTG response time, 1x Mini DisplayPort, 1x HDMI, and more. Samsung Space Monitor’s zero-level HAS (Height Adjustable Stand) allows easy positioning of the screen for optimum comfort and convenience. Its adjustment span allows viewing from a height of 8.4 inches (213 mm) above the desk top all the way down to surface level. With 4x the pixels of Full HD, the 31.5” Space Monitor delivers more screen space and amazingly life-like UHD images. View documents and webpages with less scrolling, work more comfortably with multiple windows and toolbars, and enjoy your photos, videos and games in stunning 4K quality.